Cuckoo tells the story of Rose, a woman who seems to have it all. She’s put a difficult past behind her, and has worked hard to build her perfect life. She has her husband, two children she adores, and the country house she’s always dreamed of. This life is soon interrupted by a call from Greece, when her best friend Polly calls to say her husband has died. Rose immediately invites her to stay with them, against her own husband’s wishes, but has she made a big mistake? Polly is obviously very troubled, and whilst they seem complete opposites, they obviously shared a troubled past, and there are very close ties.. although some of those ties appear to include subtle blackmail! Rose’s life gradually falls apart.. her baby becomes ill, her husband becomes distant, then Rose herself falls ill. Just how much of this is being caused by Polly is unclear.. and for me, that’s the genius of this book. The whole story is told purely from Rose’s point of view, and we are never shown what others are truly doing or thinking. This means we share with her every step of her uncertainty, confusion, and growing fear. Cuckoo is a dark, unsettling read. As Rose’s life spirals out of control, you share every step. It’s very hard to put down, and has stayed with me since finishing. It’s a brilliant debut, which is highly recommended. 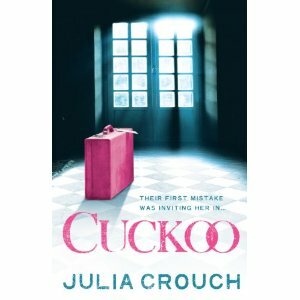 Great review Michelle, ‘Cuckoo’ sounds like a definite must read. Pingback: Every Vow You Break by Julia Crouch « BCF Book Reviews – Love books? Review books!